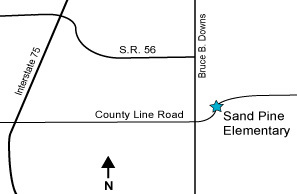 Sand Pine Elementary School is located at 29040 County Line Road, Wesley Chapel, Florida in Pasco County. You may reach us by phone at (813) 794-1900 or by FAX at (813) 794-1991. To visit us in person, take Interstate 75 to exit #275 for State Route 56. Go east on S.R. 56 toward Wesley Chapel. Take a right onto Bruce B. Downs Blvd (C.R. 581). Take a left onto County Line Road. Follow for about 1/2 mile, and the school is on the right.